Everything does not support? I am very, very disappointed. I want profesional tools that support not only the "size" file! Everything considers this information file content and does not index this information for performance concerns. It is planned to add support for indexing image dimensions in a future release. I would like to quickly find all the tiny pictures and delete, but the average speed for the Explorer Search is 1 image per second. Debugger wrote: I would like to quickly find all the tiny pictures and delete, but the average speed for thclpe Explorer Search is 1 image per second. I'd suggest taking a look at XYplorer at https://www.xyplorer.com/product.php#features. I'm very attached to Everything, but it isn't full-featured file browser. For the price, the outstanding development cycle, support, and features - I personally don't think this tool can be beat. I know a lot of people like Directory Opus (and others), but it's pricey, and I simply like XY better. It has a full 30 day trial, a gimped free version, and the lifetime license with all upgrades forever is exceptionally reasonable. I usually only like recommending good, free tools - but this is one that I'm simply a huge fan of, and the price is right. I even bought a couple of lifetime licenses for family at Christmas. It could do what you want quickly and well. It's a deep product that's still easy to use quickly - at the very least it has dual panes with tabs. It has excellent properties support. When I'm going through my movie files, I usually have width and height columns set. Both are quite quick to search through. It also has full scripting support. And it's portable with a very relaxed license. One feature that it has which I find very useful in combination with Everything is something called paper folders. You can do your Everything query, copy the paths\names to a text file, then use that text file in the same way you'd use a standard directory (though you have the choice to delete from the paper folder only, or from the location). You can then do any file operation on that subset that you wish. I've added support for searching image dimensions and id3 tags to Everything 839b or later. The following file formats are supported: jpg, png, gif and bmp. Note: Searching image dimensions is slow. ID3v2, ID3v2.3 and ID3v2.4 are loosely supported. Note: Searching ID3 tags is slow. These search functions will improve in the Everything 1.5 release, for example FLAC tags, alternate streams for meta data in Windows and video meta data. Searching properties of media files will also be added, such as track/video length. If you have an image that has a width of 480 and does not show up with a search of width:480, could you please email me the image. 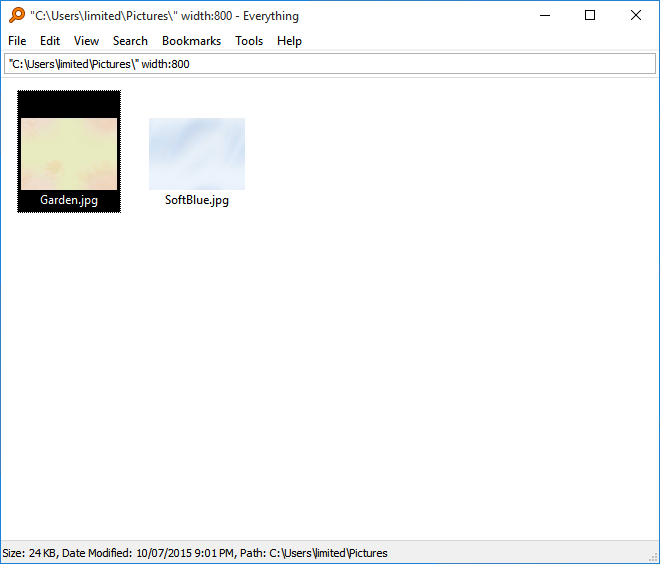 But in the folder is a lot of subfolders and subfolders in the images. Check the status bar of Everything, if it says Querying... then Everything is still searching. No results are displayed until the query is complete. it really does not work for me. Application crash all the time. First, the developer must fix this bug. Are you searching for jpg only, pngs only, gifs only? or a mixture of both? There's not much I can do to further improve the performance of dimension searching in Everything. Are the jpgs very small (< 1000 bytes)? These images may end up being stored in the MFT. This wouldn't make the current version of Everything search the image dimensions faster, you would need very specific software to search the entire MFT for image dimensions, but then it would only benefit from really small images..
Are you using a tool to store the image dimensions in NTFS alternate data streams? This would also allow very fast searching, since all the information is stored in the MFT. Everything doesn't read alternate data streams, yet, again you would need software to store the dimensions in alternate data streams, and software to read/search this data. If you are working with 100,000,000 images, how about storing the dimensions in the filename? I used a MFT based tool that can save all the dimensions, no matter how many files you have, 100 million, or a billion. It works. All Dimensions: Width and Height quickly shown using MFT. This is all possible, support search and sort, performance speed but requires a lot of RAM, not yet finalize project. Now I want to find small dimensions of (JUNK FILES 2000.000 - 5000.000 files) and delete all of the drives. @Debugger - What's the tool that you use? @Debugger - I see that you do not want to say what kind of program, maybe it does not exist? - Because from what I know MFT does not keep information regarding dimensions of the images. keep information regarding dimensions of the images. Prove by session TeamViewer, I'm right, but not someone who does not respect users. And you can not just give the name of the program - and not play cat and mouse. The program has no name. It is not available publicly. A program special written only for me, with the help of my friend-developer. Debugger wrote: The program has no name. It is not available publicly. Easy - change extension .csv on .efu and in Everything choose "Open file list"
A friend would mind to publicize the program? - I would love it tested. Nie można otworzyć listy plików: C:\Users\***\Documents\12345-=.efu nie jest ważną listą plików. You can not open the file: C: \ Users \ MY \ Documents \ 12345 - =. Efu is not a valid file list. Unfortunately, this does not work properly. I think that the application developer should tell you how to correctly convert list. Also be sure to add the NEW tab "Height" "Width"
Check CSVFileView from Nirsoft - only read... or CSVed - maybe help you. Of course, a large CSV file can be opened in any 64-bit text editor, but I want to open directly from a location on the disk.. I wanted to sort photos to 2 folders by vertical / horizontal. I realized that what I'm looking for is actually sort by aspect ratio? I didn't find such a column in Windows Explorer. A sort by aspect is on my TODO list. I don't know how "orientation:" works. Anyway, it doesn't make it. It found several images out of hundrends I have in my landscape images folder. I checked orientation: a little. I don't think this is the solution here, since orientation: in Windows Search handles the Photos tags created by a camera. I have plenty of images hadn't this tag. The orientation: search in Everything uses the images dimensions, not the tag. orientation: will only work on valid jpg, bmp, png and gif files. Everything indeed does the job. Thank you very much. I couldn't find orientation: function documented under Help > Search Syntax. Where should I look to see such functions?